Disaster strikes. How can architects help quickly, efficiently, sustainably and sensitively? LAVA’s solution is an origami cave. It features in a new exhibition opening in Sydney tonight. LAVA’s Digital Origami Emergency Shelter is a concept for an inhabited molecule. The design is based on a water-molecule, referencing the Japanese Metabolist movement`s idea of prefabricated capsules as living space. The base molecule can be shipped as a flat pack, cut out of local plywood, or dropped off by a helicopter. The interior can then be carved out of wood, cardboard, newspapers or other locally available materials. Chris Bosse said: ‘the project plays with ideas of prefabrication and personalised inhabitation, as well as stacking of multiple units, while giving an opportunity for individual expression’. Each unit contains a sleeping space for two adults and one child as well as a little space for eating and reading. Battery or solar operated LED light brings the shelter to life, turning it into a lantern, a sign of hope. 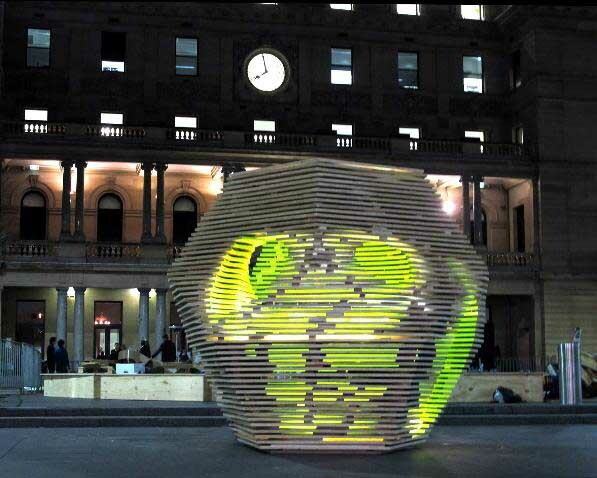 The Emergency Shelter exhibition features shelters by local and international architects and will be on display on the Customs House forecourt Sydney, Australia from 1-3 September 2011. The exhibition highlights the need for emergency shelters in disaster zones and the role of the design and construction industry in the aftermath of natural disasters. Other Australian and international architects who have designed shelters for the exhibition include Ateliers Jean Nouvel, PTW Architects, Tonkin Zulaikha Greer, Cox, Koichi Takada Architects, Sou Fujimoto and Terunobu Fujimori. The Emergency Shelter Exhibition hopes to raise awareness and aid for the thousands of people who have been displaced by Japan’s natural disasters. For the exhibition LAVA created a scale model, made from CNC cut plywood sheets. In a real situation the flat pack would be folded into an origami molecule and filled with locally available material. LAVA worked with builder Keystone Project Group and Staging Rentals.